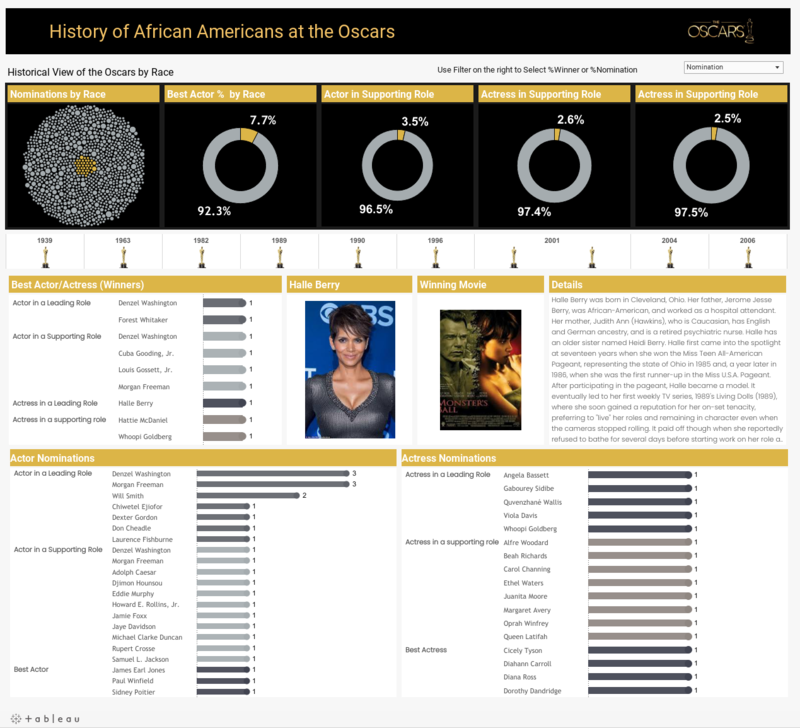 The Academy Award Goes to...These Star-Studded Oscars Vizzes! The Academy Awards are quickly approaching, and fans, myself included, are anxiously waiting to see who takes home an Oscar. 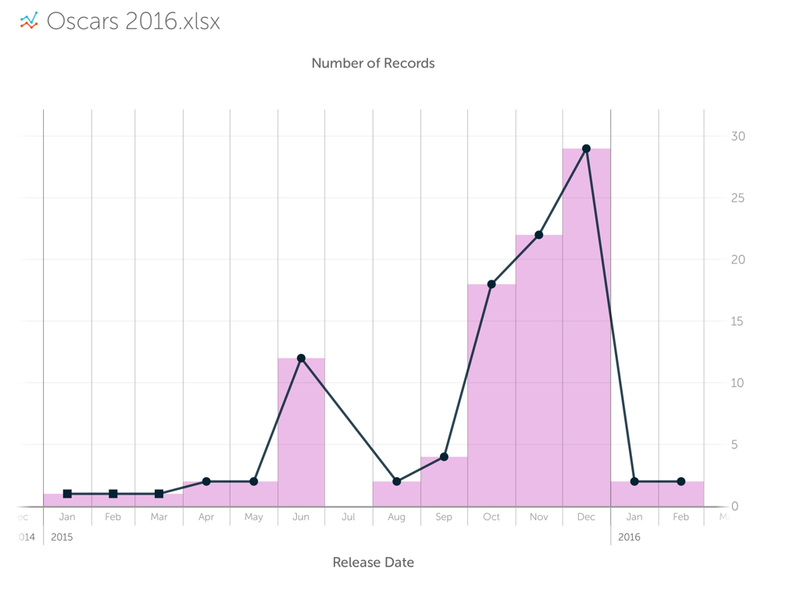 In anticipation of the big night, the Tableau community has been visualizing the data surrounding the nominees. Here are just a few of the star-studded vizzes. 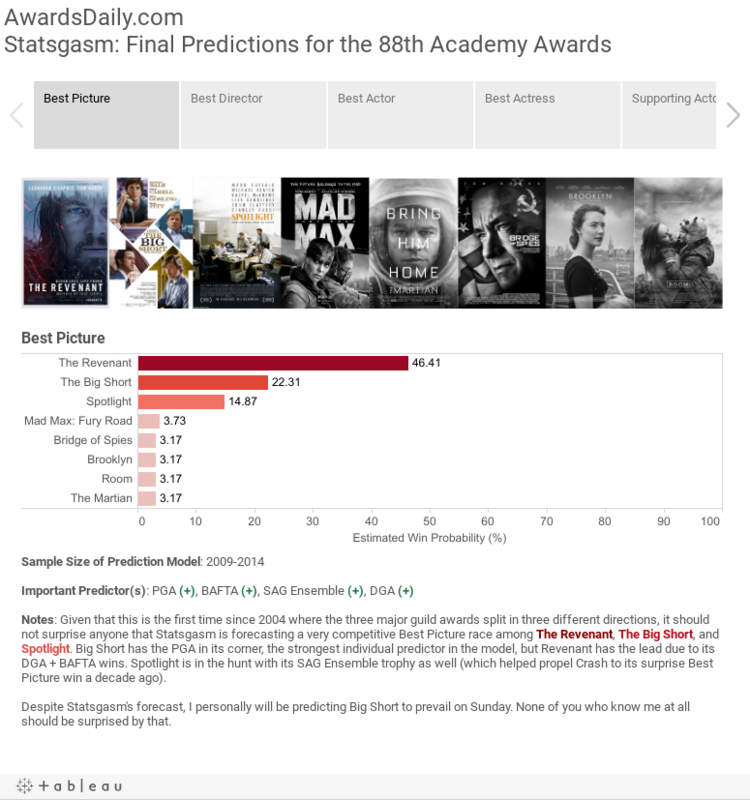 Andy Rudd visualized the statistics for the best-picture nominees. He used custom shapes and URL actions to let people dive deeper into each movie. 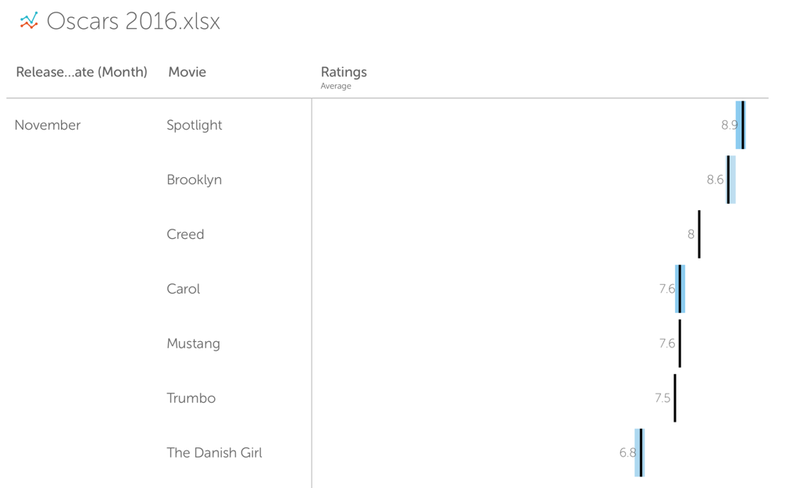 Click on a movie poster to learn the film’s IMDb score, budget, and other details. Oh, but that's not all this viz has to offer. Click on the movie title to watch the trailer right there in the viz! Marshall Flores used Story Points to show each nominee’s probability of winning. Click through to see the thought process behind the prediction for each award, and see how your personal favorites stack up. How Many African-American Actors Have Won an Oscar? 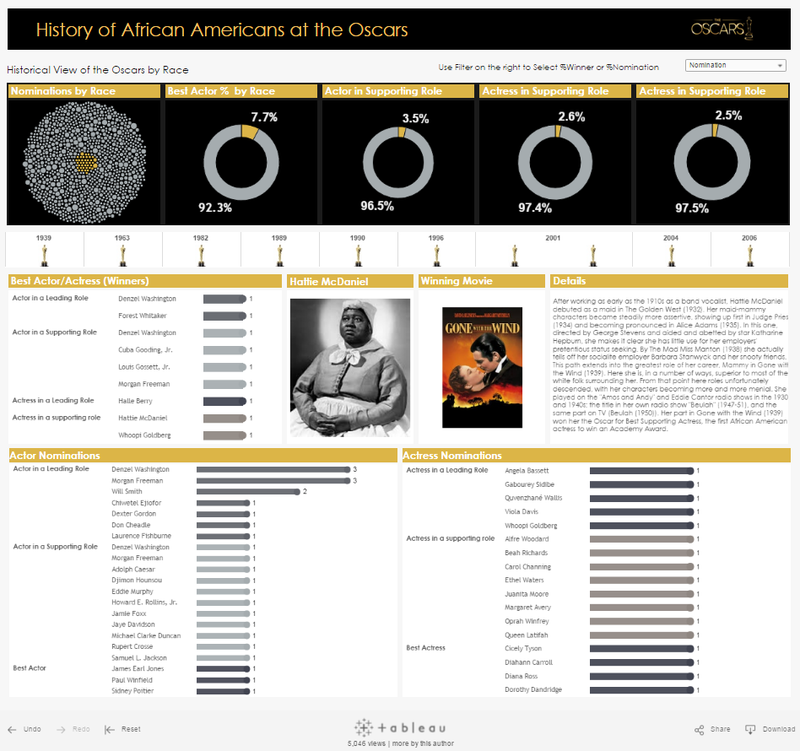 Curtis Looney’s interactive viz shows all the past African-American winners and nominees. Hover over each actor’s name to learn more about the award. The Vizable Perspective: When Do Oscar-Targeting Films Get Released? With all this talk about Oscars-related data, I got to wondering: When do most Oscar-nominated movies get released? I pulled the data into Vizable for a quick answer. The holiday season seems to be a popular time for future nominees; a handful of the nominated films were released in December. 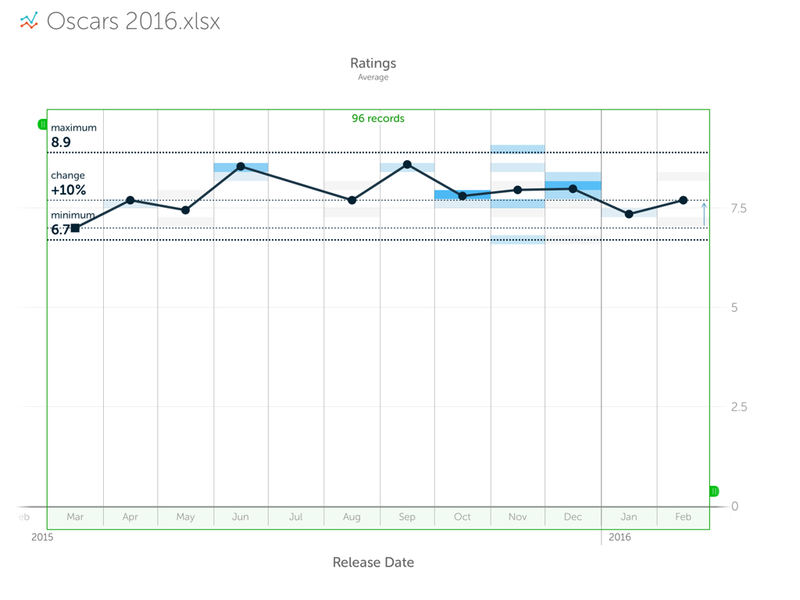 I wanted to know whether December had the best-rated movie. It looks like November had the highest-rated movie, which made me wonder just what that movie was. So I filtered my data to see just the movies that were released in November. Spotlight was the highest-rated movie in November! I haven’t seen the movie, but based on the rating, I predict Spotlight will win one of the six awards it’s nominated for. Which movie and actors do YOU think will take home an Oscar? 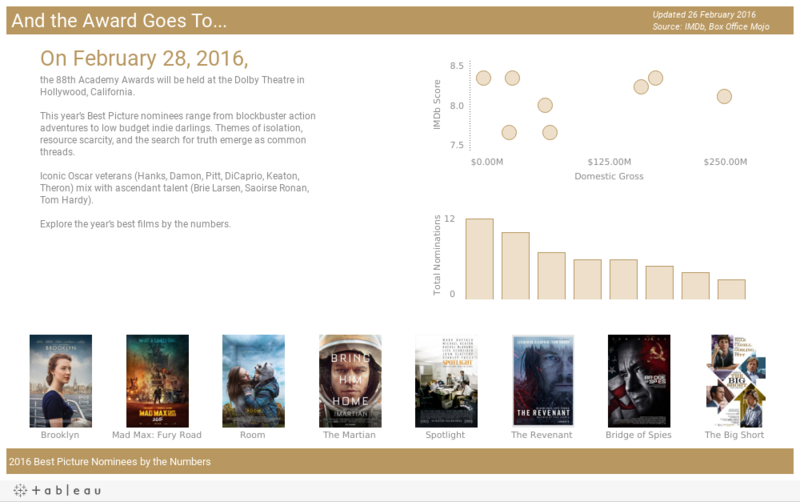 What other questions are you exploring with Oscars-related data? Share your predictions and vizzes with us @Tableau. Thanks for featuring my work! Would love any feedback...I think there's a ton more to be done here on the analytical side.